We live in the desert for heavens sake. Can you say "climate change"?? 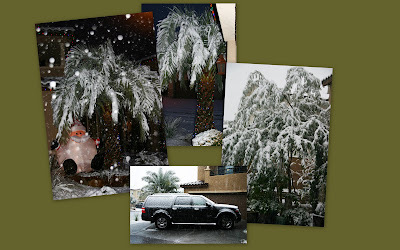 The snow on the palm trees is just wrong! 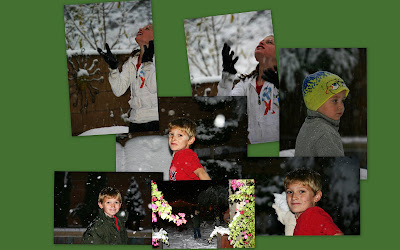 I can't believe that you had a better first snowfall than us! That is just UNFAIR! Remember that guy that thinks that Global Warming is an urban myth? HA HA HA!!!!! We are supposed to get hammered tomorrow (I hope so!) and I am headed out to buy snowboots for James in a bit. Beautiful!! It looks like Christmas! I looks like you guys got most of it this time. Our streets are all wet, but alas, no more snow. The rain that started at 5pm last night washed it away. I'm happy to see that Connor decided to put on a coat! Brrr! This in Vegas during the same week that we in the Northeast received the news that our winters are getting warmer and warmer! Global warming, baby. I thought it was awesome. I can't believe how much actually came down and stuck. It's surreal. SO been thinking of you today!